I grew up drinking very little soda. My parents rarely kept it in the house and my coaches always told me it was detrimental to my body. However, as I grew older, and especially since I moved to the south, I have enjoyed soda more and more. Although I will still opt for water or milk before a soft drink, I am at the point now where I drink soda multiple times per week. Because I enjoy making “top 5” lists based on my food and drink preferences, it is only natural that I do one on soda. So, without further ado, I give you my top choices for when it comes to deciding on a highly carbonated and sugary drink. 5. Pepsi – If there ever happened to be soda in the refrigerator, or, as we called it, “pop,” it was Pepsi. My mom grew up in a home where there was an endless supply of the stuff and she never lost her taste for it. My grandpa owned a restaurant and would always bring home cases of “Pepsi-Cola.” Because I was exposed to Pepsi at a young age and because we regarded it so highly, to this day I still enjoy it. I will always choose Pepsi over Coke and I will always enjoy a slight taste of nostalgia when I drink a can. 4. Sprite – My taste for Sprite and other lemon-lime sodas has evolved over the years. My taste for it started when I had braces. My orthodontist advised that if I did drink soda, which I rarely ever did, to drink light colored formulas. This pretty much left me with Sprite. I grew to like it, a preference that continues to this day. I like the mellow, light taste of the drink. If I am eating something really heavy, such as a McDonald’s quarter pounder meal like I had on Friday, I try to neutralize it with a Sprite. Come on man, obey your thirst. 3. Orange Soda – Call me a kid but every now and then I enjoy an orange soda. If it is 100 degrees outside and I feel dehydrated, order me up an orange soda. The way I see it, no other soda hits the spot like an orange one. 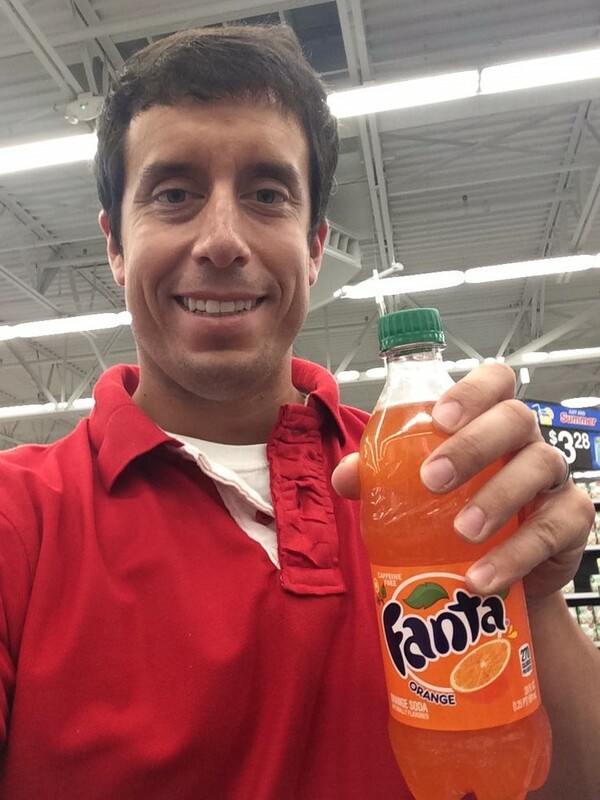 I don’t even care if it is Fanta, Sunkist, Crush, or the various other brands out there…an orange soda is an orange soda to me. An orange soda is so refreshing. 2. Wild Cherry Pepsi – My favorite soda logo, I find a can or bottle of Wild Cherry Pepsi aesthetically pleasing. But besides the attractive design, I genuinely like the taste. If I want to sit on my couch and drink a soda on the rocks, Wild Cherry Pepsi is my first choice. It is tasty, refreshing, and satisfying. Also, the smell that escapes when you crack open a can or twist open a bottle is the absolute best. 1. Dr. Pepper – Did you know that Dr. Pepper is actually the oldest soda? Well, in my book, the oldest is also the best. When it comes to types of soda that I see people addicted to the most, I can narrow it down to three major ones: Diet Coke, Mt. Dew, and Dr. Pepper. In my opinion, Diet Coke is flat out not very good and Mt. Dew is way too sugary. But with Dr. Pepper I can understand the mania. Dr. Pepper has that smooth and unique taste that allows you to drink more than one…just ask Forrest Gump. In all honesty, I just really enjoy Dr. Pepper. Like I said, there is no other taste like it (besides imitators). If you had to fill a refrigerator for me of only soda, I would say stock it up with Dr. Pepper. 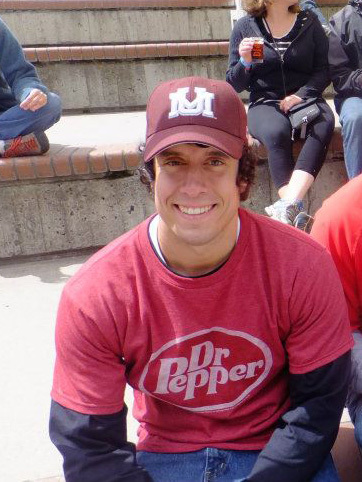 Yes, I like Dr. Pepper so much I even have a Dr. Pepper shirt. I know what you are asking right now…why don’t you just drink Cherry Dr. Pepper? Although I do like that particular flavor, it doesn’t beat my top two flavors when they are served individually. Thanks for reading! Don’t Blink. Happy Memorial Day! I hope everyone has had a great weekend. It has been a nice (and very hot) one for our family. Although we have taken it pretty easy the past few days, the big highlight of the weekend came last night when Sloan went for her first boat ride. She cruised down the Intracoastal Waterway as we caught an evening ride on Sidney’s dad’s boat. June is almost here and that means we will soon celebrate our wedding anniversary. Along with reminiscing about that beautiful day, we will also remember the time in paradise we enjoyed immediately after it. For our honeymoon, we went to Cancun. It was an incredible trip full of romance and memories. Although Sidney and I spent a lot of time just the two of us, we still managed to meet new friends. Toward the end of our trip we met several different couples from both the US and around the world. 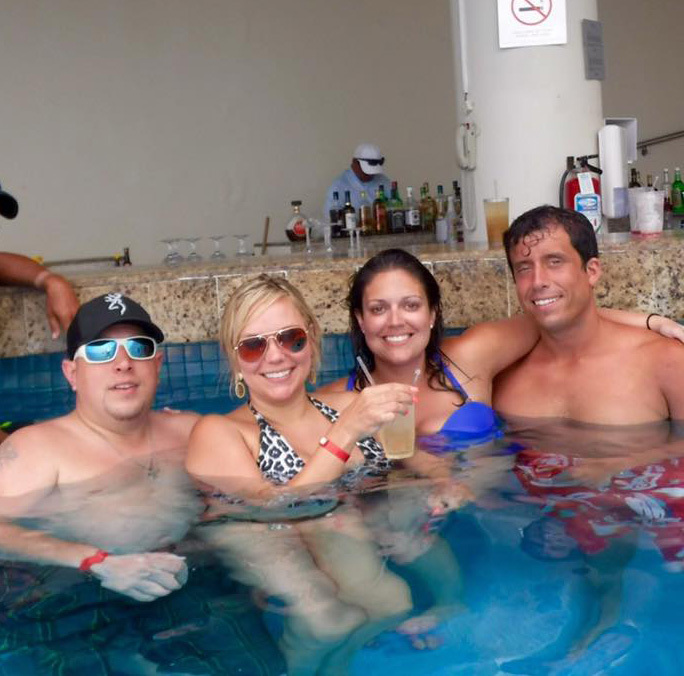 We all spent the day together in the pool at our resort. One of these particular couples, Ashlee and Chris Morris, had come to Mexico from Houston to celebrate their 10th wedding anniversary and renew their vows. We had a very nice time meeting Ashlee and Chris and since the trip we have kept tabs on each other via Facebook. Ah, yes, Facebook. Because of social media, I learned the devastating news that their daughter, Zoe, suffered a brain aneurysm last week. For the past several days, Sidney and I have waited for status updates on this extremely scary situation. 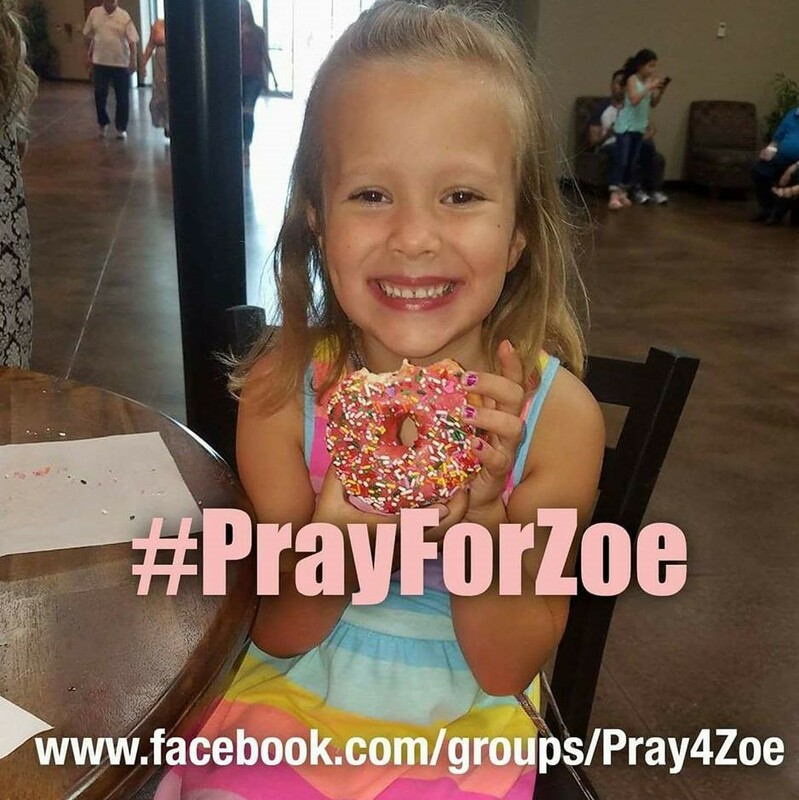 Doctors at Texas Medical Center performed brain surgery on Zoe and removed an arteriovenous malformation. At this point in time, Zoe is in a medically-induced coma. Because of prayers and top-notch medical care, Zoe will pull through. However, the long term impacts are unknown. For those of you with kind hearts who have the desire to help someone you have never met before, Ashlee and Chris will tell you that the most important thing you can do is pray. For those of you who are able to give financially, you can also make a donation to the Zoe Lee Morris Medical Fund. When you go to the fund’s website, you can learn the entire week-long nightmare (with actual medical language that I am incapable of articulating) that Zoe and her family lived out. Awful situations like this hit home much harder once you have kids of your own. Sidney and I know how scary something like this is and our thoughts and prayers are 100% with the Morris family. Don’t Blink. Another Interesting Cereal Spotting – Yesterday at Walmart I became aware of a couple new flavors from the Cinnamon Toast Crunch brand. You can now purchase Strawberry Toast Crunch and Blueberry Toast Crunch. As a big fan of cereal, especially Cinnamon Toast Crunch itself, I am very intrigued by these two new flavors. I am thinking both options probably don’t contain the cinnamon component of its parent cereal but you better believe that each one will pack a whole bunch of sugar. Perhaps this is an excuse to try both of them and then blog about it? 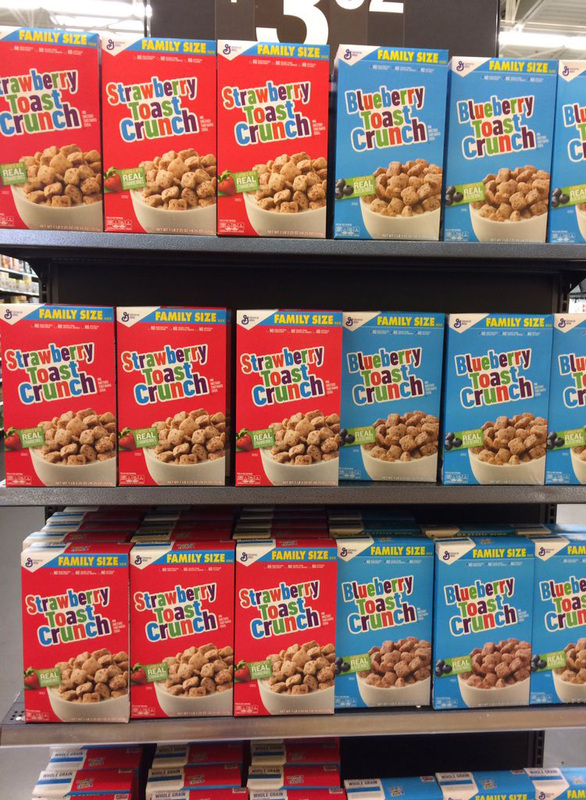 I took this photo of Strawberry Toast Crunch boxes and Blueberry Toast Crunch boxes when I saw the display at Walmart yesterday. “Suffering” With No Hot Water – There is nothing like a cold shower to wake you up! During the weekdays I shower on campus in the locker room of our fitness facility. Usually it is a pleasant experience but this week it has been a bit chilly. Since Tuesday, I have maneuvered around to try to avoid the brunt of the powerful stream that shoots out from the shower head. 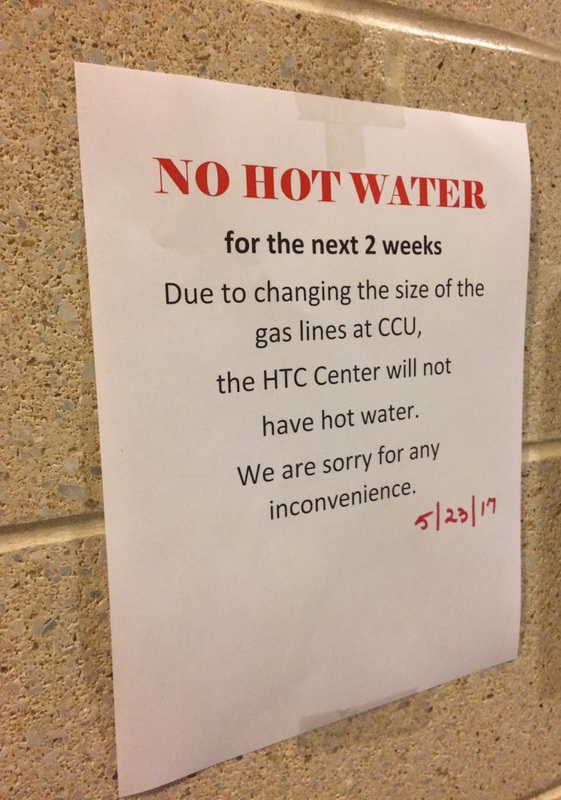 With work on gas pipes taking place, the gym will be without hot water for two weeks. I wrote at length about what goes through my mind when I take a cold shower but there is one fact that can’t be disputed: a cold shower is better than no shower! I will be without hot water when I shower at the gym at least throughout next week. 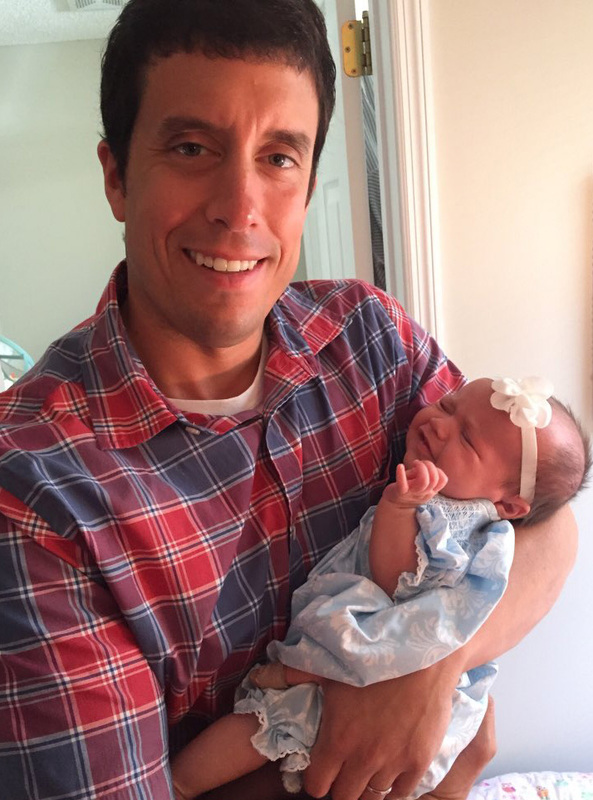 Big Day In One Month – I have had several people ask me when Sloan will be baptized. The answer is exactly one month. On June 25, our daughter will be baptized at St. Andrew Catholic Church. Judging by what a good girl she is at mass and by how much she enjoys listening to hymns, Sloan is ready for the sacrament right now! But my mom and brother will be traveling for the special occasion and my sister-in-law is about to give birth to a precious baby boy so we all knew that a date late next month would work best. I can’t wait for Sidney’s family and my family to be together again. 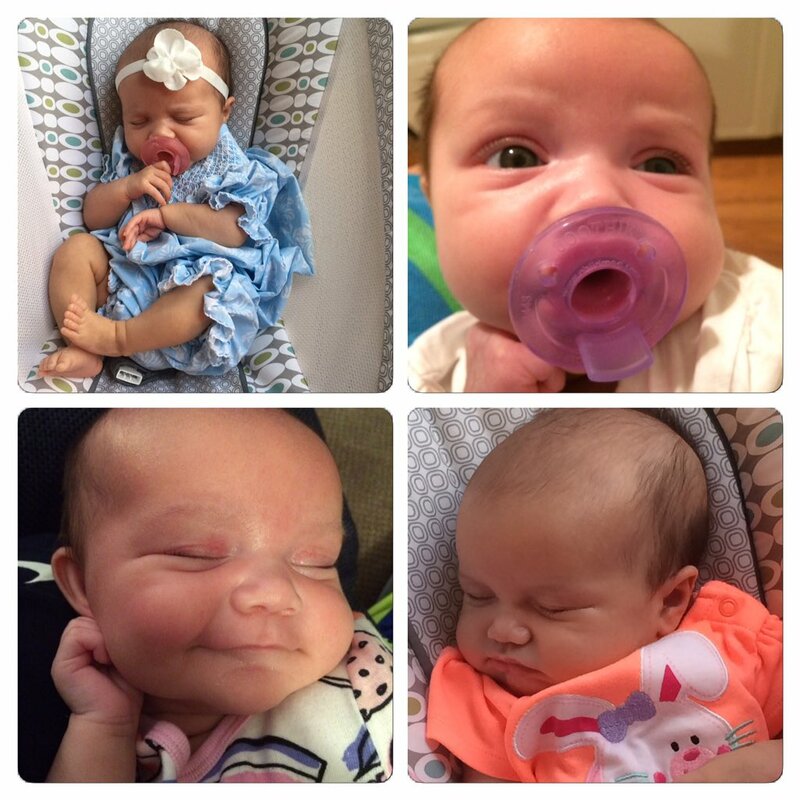 Sloan Photos – Sloan has adjusted very well to her first week at daycare. I am proud of both her and mommy. When either Sidney or I walk across a room, Sloan’s eyes will follow us. It melts our heart. Here is the latest photo collage. The latest Sloan collage. She turns 10 weeks tomorrow. From The Archives – I must admit, the blog posts I have written the past two years on this date have been a couple of my favorites. 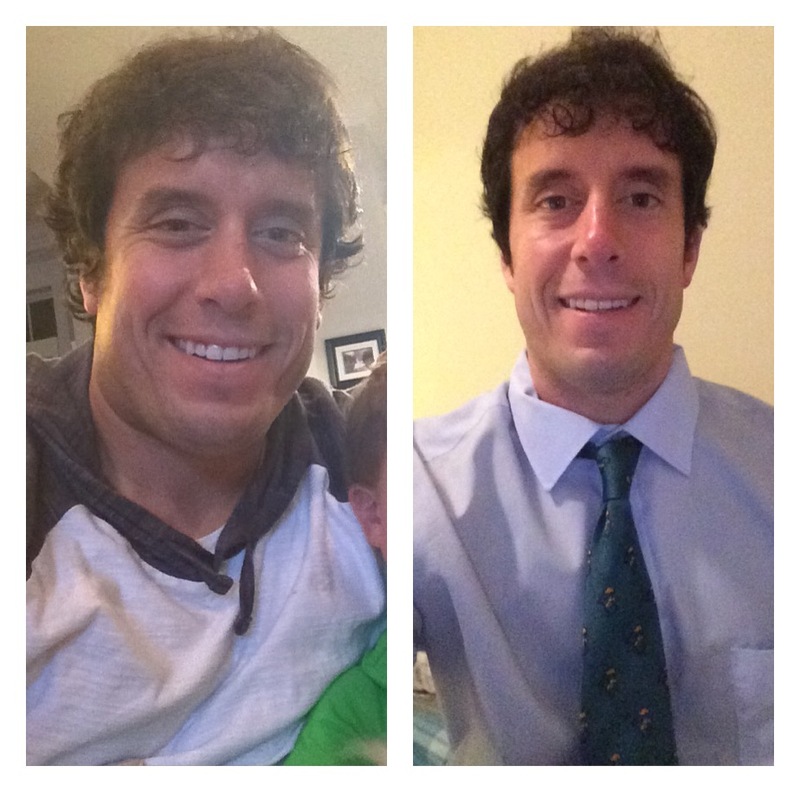 On May 25, 2016, I wrote about the wacky method I used to lose 30 pounds for my wedding. Then, on this date two years ago, I stood up for a segment of the population that is sometimes ridiculed for sharing a certain hobby/lifestyle on social media. I recommend reading them both! I told the story about how I lost 30 pounds on May 25, 2016. There you have it, I am done! Have an awesome Memorial Day weekend. Thank you for your support of my blog. Don’t Blink. If you get excited about national restaurant chains opening up, Myrtle Beach is a great place to be over the next few weeks. Just in time for the tourist season, several very well-known locations will open their doors. Luckily for Sidney and I, many of these places are within close proximity of our house. For tonight’s blog post, I wanted to feature five new restaurants that are within a ten minute drive of where we live. I will also rate my excitement for the opening of the business based on a 1-10 scale. I have watched commercials for Dave and Buster’s my whole life. However, despite being exposed to the chain’s marketing, I have never spent time in one. I am excited for that to change. I have had a ball at other establishments with the same business model as Dave and Buster’s but I have never played in the one that pioneered the concept. Located at Broadway at the Beach, a better spot in Myrtle Beach could not have been chosen. Can’t wait for those doors to open! 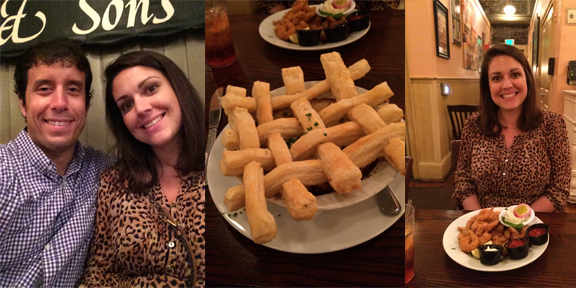 When Sidney and I took a trip to Savannah a couple years back, we ate at Paula Deen’s Family Kitchen to celebrate our one-year anniversary of dating. Sid was extremely excited to eat there while I had never really known that Paula Deen had a restaurant chain. However, after that night I would never forget it! For those who enjoy Southern cuisine, this is your place. The biscuits they bring you while you wait for your food is the best part (and the food itself is really good so that is saying something). Also, having the option to order off a menu or go for a country style buffet offers the best of both worlds. I hope the Myrtle Beach location is bigger than the one in Savannah, however, because space was at a premium and the wait list was long. Sidney and I at the Paula Deen restaurant in Savannah. I had a chicken pot pie. 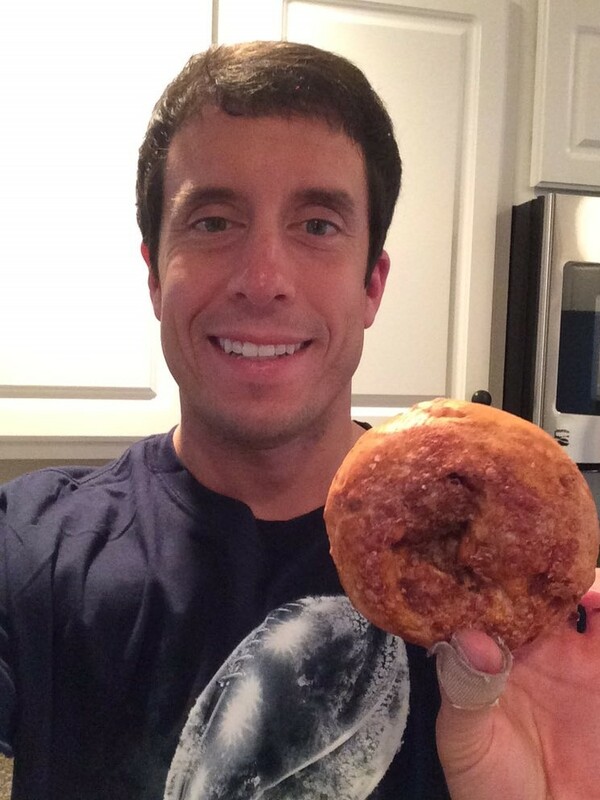 Whenever a member of Sidney’s family would go to a city that had a Panera, they would always stop and clean that particular location out of its cinnamon chip bagels. Thus, over the past few years, I have had a cinnamon chip bagel or two. In fact, in celebration of the grand opening of the Panera that is now conveniently right in the middle of my commute from work, I bought a bag of bagels to surprise Sidney with when I arrived home yesterday night. Although I have not tried Panera’s sandwiches, soups, or salads, I am sure it will happen soon enough. Yesterday, I surprised Sidney with cinnamon chip bagels from Panera. 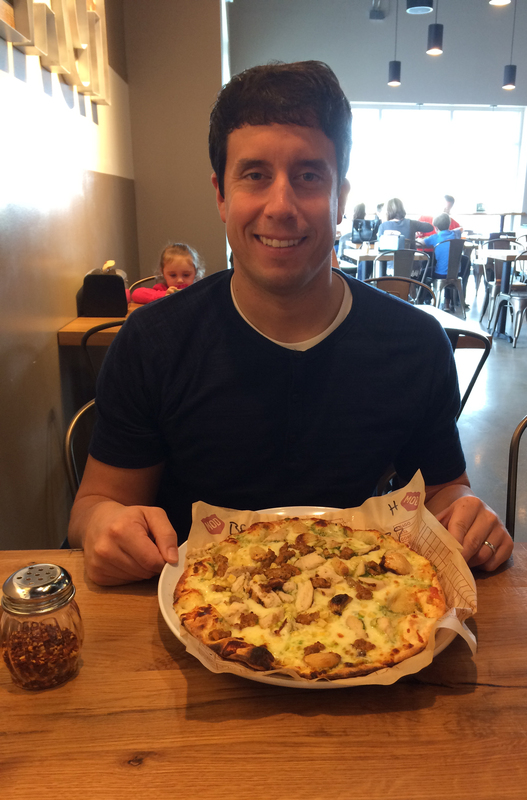 Yes, many of you know that there is a MOD Pizza in the general region of where I live. However, as of today, there is now one that is smack-dab in the middle of work and home. In fact, every night I will have to deal with this new MOD Pizza location calling my name as I drive by. Tempted to attend today’s 11 a.m. grand opening where the first 52 people got a free pizza,, I decided to hold off because I know I will have plenty of time in the future to satisfy my MOD fix. A photo of me with the pizza that I built from scratch. I love MOD Pizza. This place is supposed to be the real deal. The creative menu supposedly takes pub food to the next level and 60 beers are available on tap. Adding to the intrigue, Carolina Ale House restaurants are supposed to be really cool inside and the atmosphere is supposed to make you feel right at home. However, believe it or not, I am not much of a craft beer guy. Because of that, I am not counting down the days until June. Okay, this isn’t a food place. However, a Dollar General recently opened up right outside our neighborhood. In fact, we can easily walk to it! Although not a traditional dollar store, these no frills locations have everything you need at a reduced price. Since the end of April, if Sidney and I need anything from batteries to beverages to bathroom tissue, all we have to do is make a short two minute trip to our local Dollar General. Any exciting restaurants or other businesses opening up where you happen to live? Let me know, I will share in your enthusiasm with you. Have a great evening. Don’t Blink. Since becoming a dad, I have not had a single instance where I wasn’t proud of Sloan. However, this past weekend I had a defining “Proud Father” moment. Before I became a dad, I would probably respond to that opening paragraph with something along the lines of “How can you be genuinely proud of a 9-week-old?” I mean it is not like Sloan’s brain is developed enough to ace a test. She can’t even crawl at this point so she can’t accomplish an athletic feat. She isn’t talking yet so she surely can’t blow us away with her singing voice. But when you become a parent of a newborn, you immediately realize what being proud means. It isn’t about achieving something that society deems as an accomplishment. Just the fact that your baby happened to start as a speck in the womb, grow into an actual infant, and then enter the world is reason enough to be full of pride. However, like I said, Sloan recently provided me with a specific prideful moment that I will always remember. On Sunday, I took Sloan to church by myself. It was my first real time taking Sloan somewhere without anyone else. I walked into St. Andrew carrying a car seat with a big diaper bag draped over my shoulder. I navigated the crowds and found a seat at the end of a pew. I then crossed my fingers that my daughter would make it through the mass. This was Sloan and I after mass this past Sunday. I kept Sloan in her car seat for most of the service. Because she was semi-covered and because she was a perfect angel, fellow parishioners who were fixated in prayer didn’t really notice the baby at the end of the row. After we recited the Lord’s Prayer and offered the sign of peace, I knew it would be just a couple minutes until I would remove Sloan from her car seat and take her up to the altar with me for Holy Eucharist. I knelt down with the congregation as we recited the important words of Lord, I am not worthy that you should enter under my roof, but only say the word and my soul shall be healed. At that moment, as the eucharistic ministers approached the altar, I sat back up in my pew. I then slowly and gently took Sloan out of her seat and cradled her in my arms. The couple behind me immediately cooed and asked her name and age. I answered their questions and they remarked on what a beautiful baby she was. Little did I know that this would be just the tip of the iceberg. By that time, the communion line had started. Sloan and I were seated in the front half of the church but we were in one of the back rows of the particular section. Not only that, but because of our location, we (well, I) would be receiving the holy sacrament from the priest himself right at the front of the church. Thus, we would be walking past a lot of rows and a bunch of people to get to Father Jose. I had the pleasure of taking Sloan right down the aisle of St. Andrew Catholic Church and straight up to the front of the altar. The usher gave our row the signal to ease into line. Sloan and I moved from one end of the row to the other and then took a right to head toward the altar. At that moment, I swear I knew what Sidney felt like the day she walked down the aisle at our wedding. I kept my eyes either directly on Sloan or straight ahead but I could feel eyeballs looking right at me. Well, let’s be honest, I could feel the eyeballs looking at Sloan. It was such a beautiful feeling, one I couldn’t really even find the words to describe to Sidney when we got home. The whole way down I could sense the gazes and hear the ever so light gasps of the people celebrating mass that day. When I finally reached Father Jose he had his wide grin once again. He gave me my host and then gave Sloan her blessing. On the way back to our seats I could again feel everyone looking at Sloan. Although I still looked mostly straight ahead, I did shift my eyes back and forth as we walked back. I could see smiles. Upon returning to my pew I was hit with emotion from not just receiving Jesus’ body but also from the reception that Sloan got. Even though I had absolutely no scientific evidence that people actually were indeed touched by Sloan, the feeling I had in my heart was proof enough. I was one proud daddy. With Sloan’s presence now out of the bag (ummm…I mean out of the car seat), parishioner after parishioner came up to me at the end of the mass to say what a precious little girl I had. Although the compliments were so sweet and nice, it still didn’t beat the feeling I had walking down the aisle with her. When Sidney and I talked when I arrived home, she told me that there is just a sweet spot that people have for a daddy by himself with a little baby. I would say her assessment is right. I know I spent most of this post bragging but it was a moment I will remember for the rest of my life. Thank you God for blessing Sloan with her mama’s looks. Don’t Blink. A day came today that Sidney was dreading. 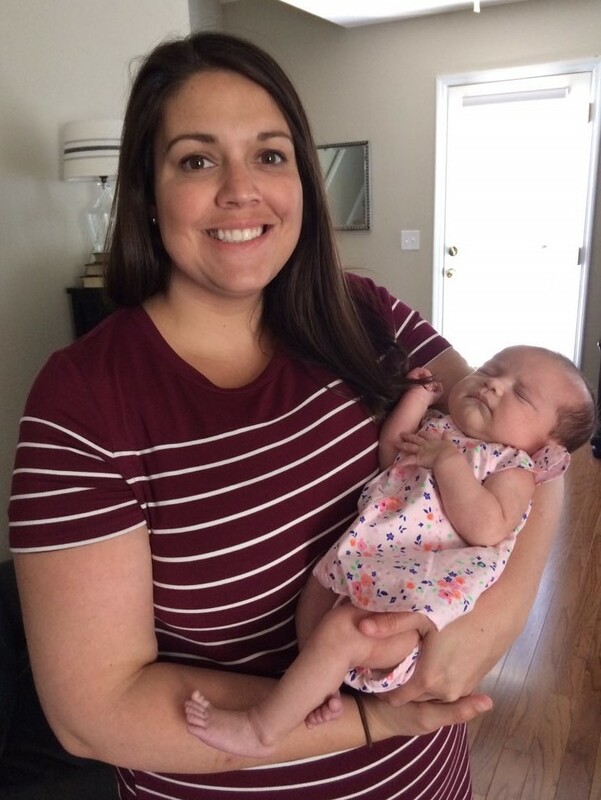 After nine weeks of maternity leave, she returned to the classroom in her role as the best 2nd grade teacher in the world. Her students were overjoyed to have their teacher back and Sid was also happy to be reunited with her class. But even those with the coldest of hearts know that returning to work after two months of bonding with your firstborn is hard. Understandably so, some tears were shed yesterday as we came to grips with the looming reality of what Monday would bring. However, as bedtime approached, Sidney impressed me. Completely motivated, she prepared Sloan’s bottles, clothes, and other items for daycare. She put things in order for her own first day back at school as well. She went to sleep with everything ready to go for what would be a tough day. This morning, Sidney was so strong. She rose right when her alarm went off, got ready, and then got Sloan ready. She didn’t let emotions overcome her and just focused on remaining positive. When she dropped Sloan off at the home where she will stay over the next two weeks, Sid kept it together. Along with the physical logistics of packing for Sloan, it was obvious that Sidney had mentally prepared for this morning as well. I was so proud of her. It was a tough 24 hours but our little family is reunited now and very happy. Make no mistake about it, Sid was not the only one dreading this day. I didn’t want this morning to come either. First and foremost, it is tough to see your spouse in pain. It broke my heart to see Sidney going through such a difficult time. But to be honest, I was also battling her return to work for my own selfish reasons. My own day in the office would no longer be the same. No longer would I receive Facetime calls “from” Sloan. No longer would I get descriptive updates from mommy on how our little one was doing. No longer would I get Snapchats and photos of my daughter enjoying her day. 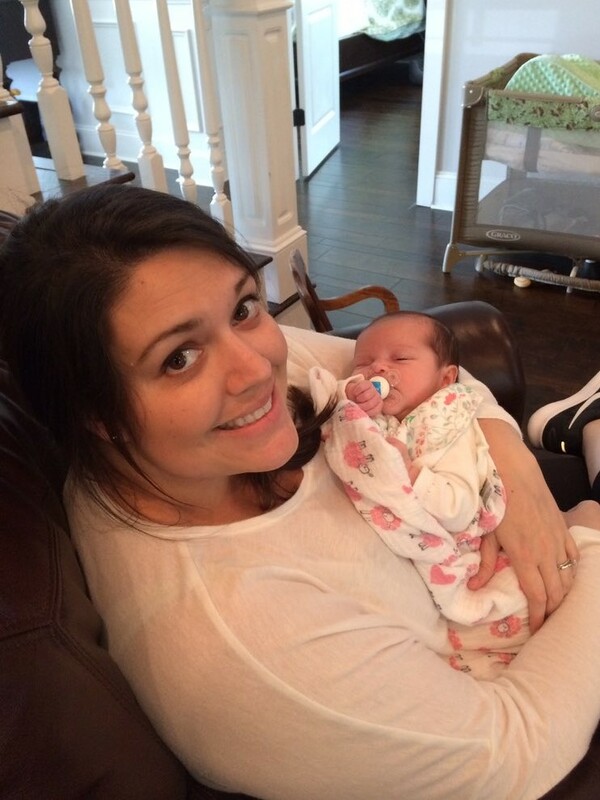 No longer would I get the peace of mind knowing that Sloan was in the loving care of her amazing mother. But if Sidney could get through it, so could I. The strength she has shown with this situation has rubbed off on me. There is a major silver-lining in all of this: Sidney only has two weeks of work left before summer vacation (I can hear all my readers yelling Oh come on, that’s it?! Toughen up, Brent!). Before we know it, Sid and Sloan will be back to spending every single minute together. This is a major comfort to the two of us but it still didn’t take away the difficulty of dropping Sloan off this morning. I truly admire the way Sidney handled this inevitable, but tough, situation. 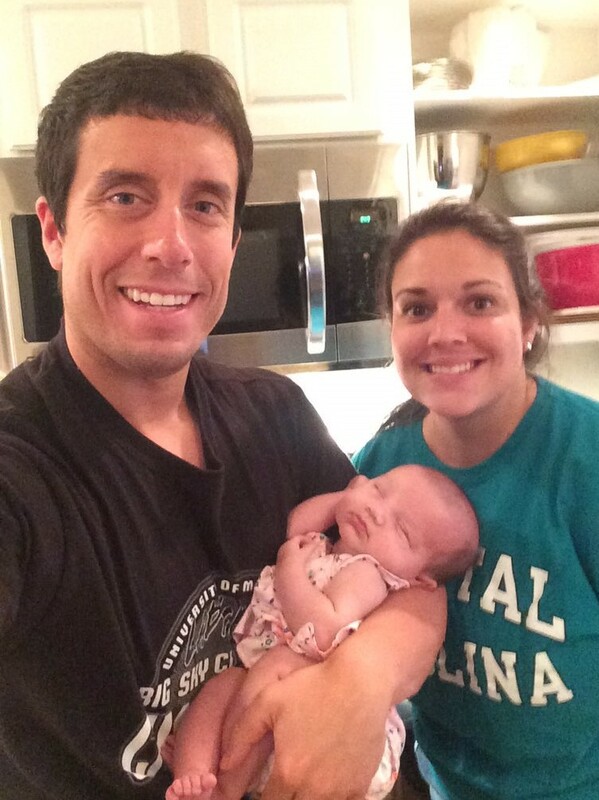 As I write this tonight, our little family is back together and we couldn’t be happier. We know these next several days will fly by and then the best summer ever will begin. Don’t Blink. Good evening to all my readers! I hope everyone had a good Mother’s Day and that your week has gone smoothly up until this point. It is now time for my latest Thursday Rundown. 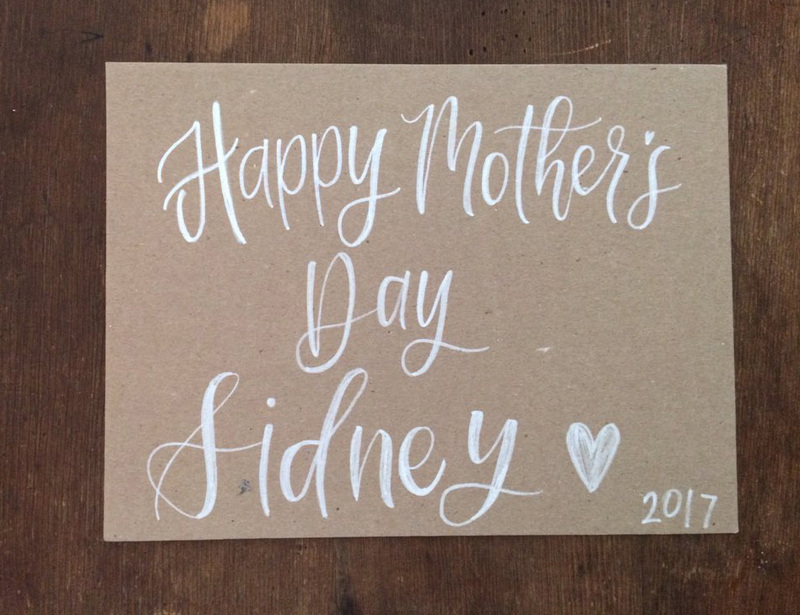 Mother’s Day Recap – We had a very pleasant time celebrating Sidney’s first Mother’s Day. It started off by her walking into the living room to find her gift (Sloan and I gave her a Fitbit). We then enjoyed a lazy morning/early afternoon laying in bed and watching a few different movies. Later on in the day, we went out with Sidney’s family to one of our favorite restaurants for Mother’s Day dinner. After hanging out at my in-laws’ house for a bit, we came back home and cuddled with Sloan. What a great day! 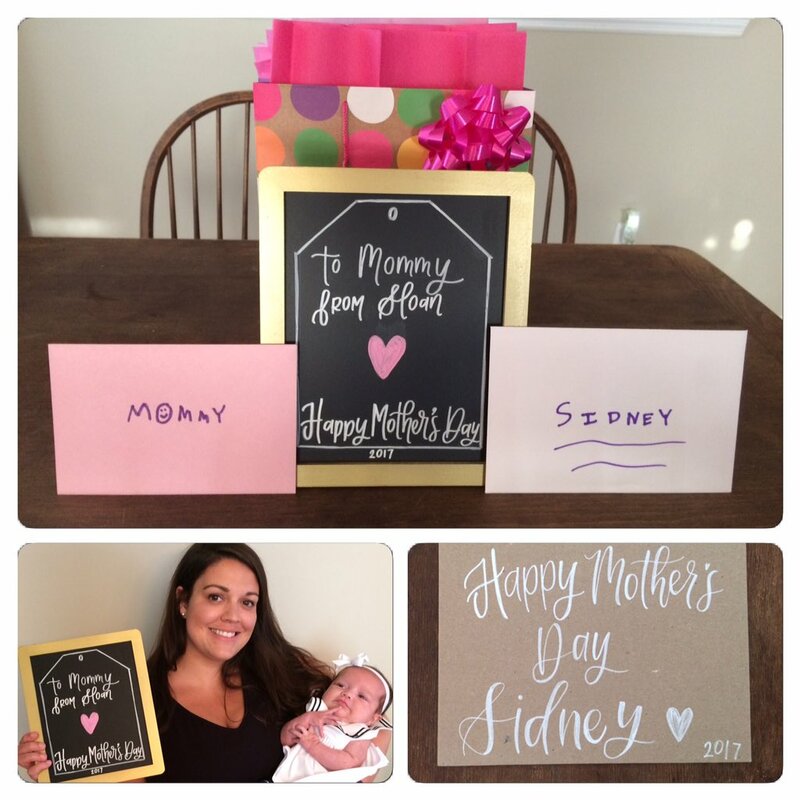 The photo at the top is what Sidney saw when she walked into the living room on Mother’s Day morning. In the polka dot bag was a Fitbit. Three Years – This past Tuesday marked three years for Sidney and I being together. That evening I made an Instagram collage that looked back on the four different May 16 dates we spent together. Reminiscing at the different years is fun but the best part is noticing that a third person joined us for this year’s photo. 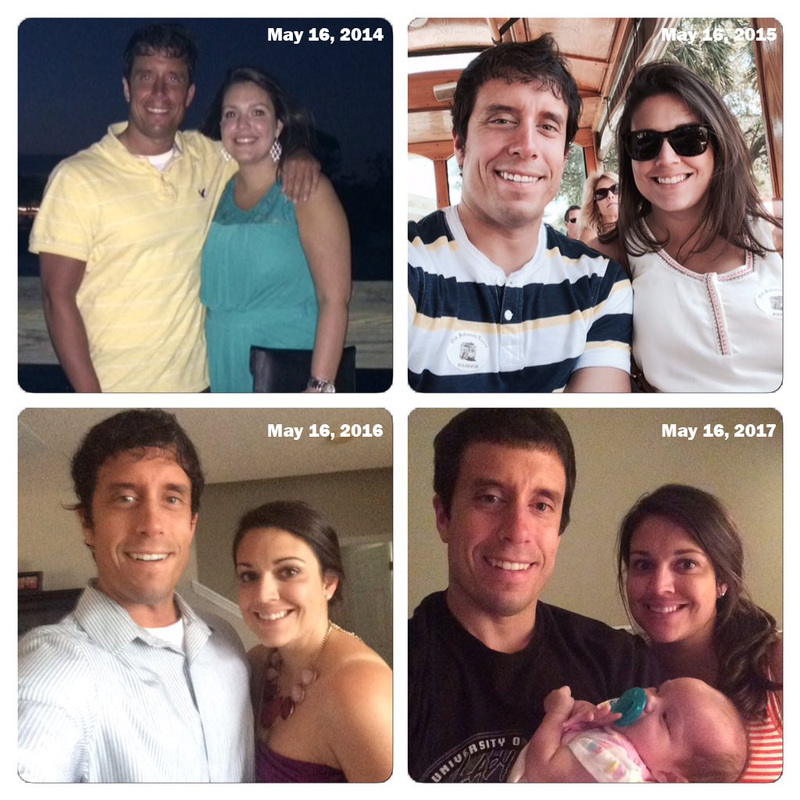 A look at the four different May 16s we have spent together. Movies Watched This Weekend – Although Sidney and I can’t really go to the movies that much anymore, we can still watch them at home. This past weekend we viewed “Mona Lisa Smile,” “The Ugly Truth,” and “Couples Therapy.” If I had to say which one I enjoyed the most, I think I would have to go with “Mona Lisa Smile.” I had no idea what it was about when Sid chose it on Netflix but I gave it a chance and actually liked it. Great choice by my wife! 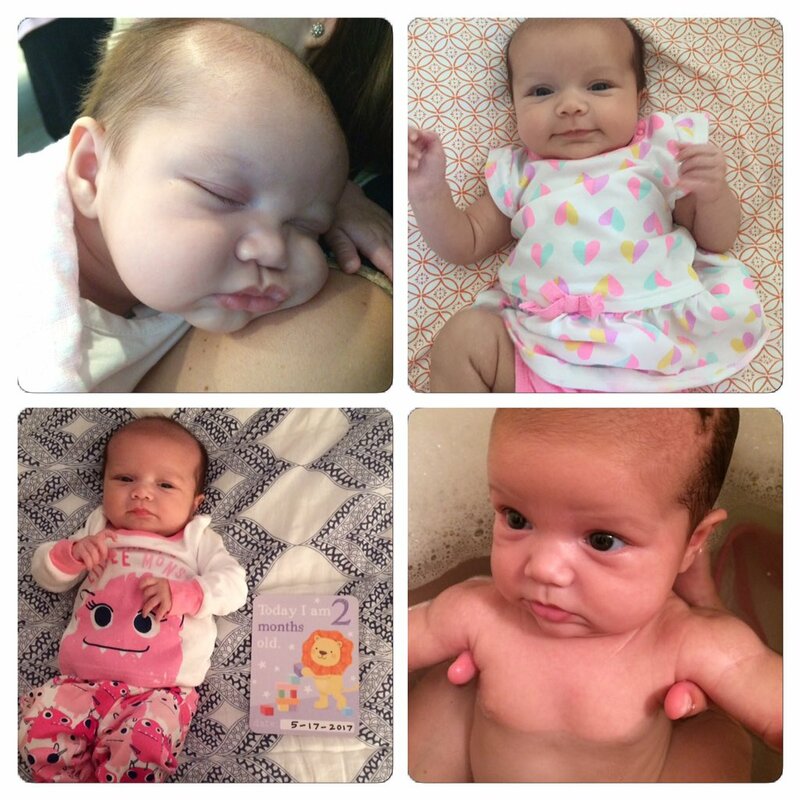 Sloan Photos – Yesterday, Sloan became a 2-month-old. We took her to the pediatrician today for a scheduled appointment and everything looked great. Time is going by so fast! Here is the latest photo collage with images from this past week. From the Archives – One year ago on this date, I wrote about a big controversy that centered on brownies. I weighed in with my opinion. On May 18, 2015, I blogged about a certain tragedy that happens way too often and that literally keeps me up at night. Then, three years ago, I wrote about one of Myrtle Beach’s most signature and controversial events. If I had to pick one of these three posts for you to read, I would probably recommend the one from 2015. Have a great weekend! For us here in South Carolina we will continue to soak in the sun. For my friends in Montana, I really hope the snow melts soon. Don’t Blink. This past weekend, Sidney made me a unique dish I had wanted to try for a few months. Back in January, I briefly wrote about peanut butter pasta in a Thursday Rundown. This delicacy became known to me when I watched an episode of Trisha Yearwood’s Southern Kitchen cooking show in which she used peanut butter as her main ingredient in all the dishes she prepared. While the peanut butter cookies, cake, and pretzel rods all looked delicious, it was the pasta that really stood out to me. On Saturday evening after church, our little family stopped by the grocery store. As we discussed what we wanted to have for dinner, I made the suggestion that perhaps it was a good night to try peanut butter pasta. Sidney agreed! 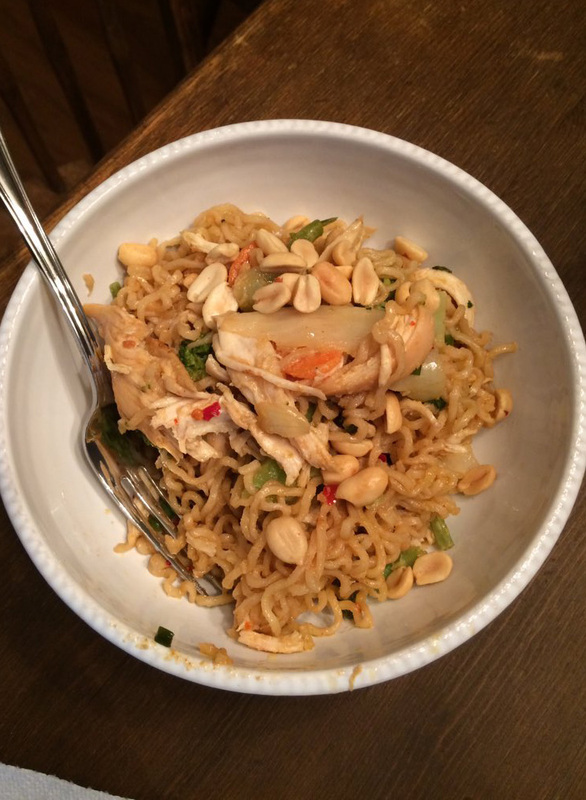 We started cruising through the aisles picking up the ingredients we needed: ramen noodles, chicken, frozen stir-fry vegetables, chili sauce, a lime, soy sauce, and PEANUT BUTTER. Back at home, it only took Sidney about 30 minutes to prepare our special meal. Before I knew it, we were sitting at the dinner table with a bowl of peanut butter pasta in front of each of us. It was time to dig in! My first bowl of peanut butter pasta that Sidney prepared for me. Our initial reaction? We both liked it! However, as we continued to eat, Sidney changed her opinion. Although I was still loving the pasta as I finished off my first bowl, Sid wasn’t too crazy about it anymore. I served myself a second helping while Sidney didn’t quite finish her first. I enjoyed the peanut butter pasta because it was spicy, nutty, and hearty. It also had incredible texture as peanut butter is an ingredient that settles well on pasta and brings other ingredients together. However, there is one dynamic with this dish that might separate those who like it from those who don’t. Even though peanut butter goes great on celery, some might not like it on other vegetables. The veggie medley we purchased had carrots, broccoli, and peppers in it. Some might believe that those items don’t go as well with peanut butter as perhaps jelly does. But it definitely didn’t deter me. A couple final notes – I added a topping to my pasta that the recipe didn’t call for. At the grocery store, I had thrown a small can of peanuts into the cart. Before I started eating Sidney’s cooking, I sprinkled some on top. Last night when I ate leftovers I once again added peanuts along with some crushed red pepper and extra soy sauce to make up for the flavor that was potentially lost after sitting in the refrigerator. Also, peanut butter pasta is much more of an Asian-inspired dish as opposed to an Italian one. Unfortunately, garlic bread or parmesan cheese won’t go well with it. The word “pasta” is a bit deceptive. Whatever you call it, however, I believe the combination of ramen noodles, peanut butter, and spices is a winning one! Thanks to Sid for making me a wonderful dinner. Don’t Blink. Two years ago on this date I walked out of the office into the bright sunshine. It was the first Friday of the summer hours schedule at Coastal Carolina University so it was just past 1 p.m. I hopped in my car and instead of driving back to my apartment to hang out at the pool I battled traffic en route to Coastal Grand Mall. I walked inside the shopping center and went straight to a certain store. I approached the counter, pointed at what I wanted, and made the purchase. For the price and significance of the item, the quick way I went about doing my business surprised the clerk just a bit. However, I was a man who knew what I wanted. The buying of an engagement ring is not something a guy takes lightly. As I mentioned above, it carries with it far more than just financial implications. 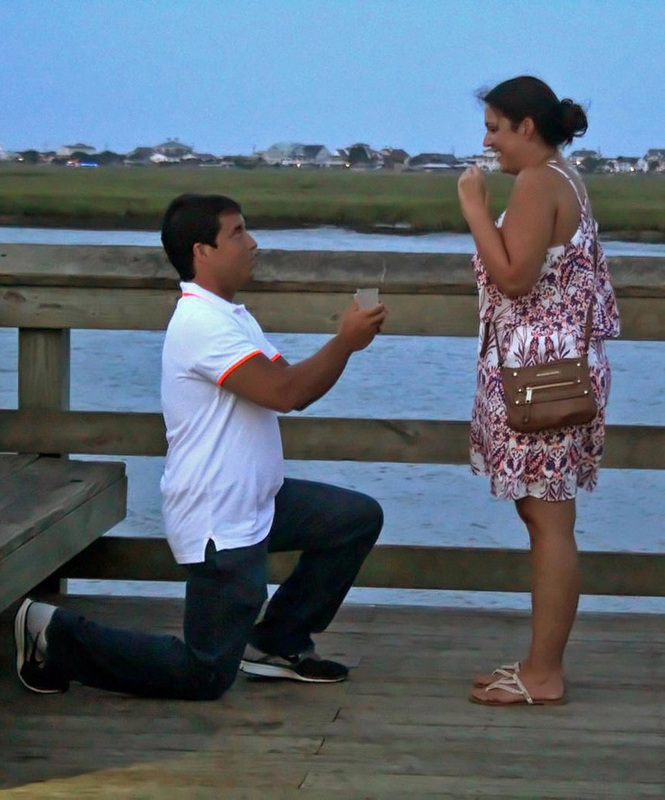 The act of purchasing that rock is the first step to securing a life of happiness with the girl of your dreams. Buying the engagement ring allows you to take a huge step toward marrying the woman of your dream. With so much riding on the big purchase, the added anxiety of wondering whether you are getting your hopeful fiancé something she actually wants to wear the rest of her life could send any dude over the edge. Because I wanted to prevent a heart attack, I had picked Sidney’s brain beforehand to gauge what type of a ring she might want. Well, to be honest, “picked Sidney’s brain” doesn’t truthfully describe it. It was more like tell me exactly what you want. This photo is from the night I asked Sid to marry me. Because I asked Sid exactly what she wanted, I didn’t stress over whether she would like the ring or not (instead, I stressed over whether she would say ‘yes’ or ‘no.’). Some men are fly. They have great fashion sense, smoke expensive cigars, and speak numerous foreign languages. They also know jewelry. This type of guy can discuss the finer points of diamonds and identify a ring his partner will waste no time showing off to all her friends. Luckily this wasn’t an awkward discussion. Sidney was very honest and told me exactly what she wanted. 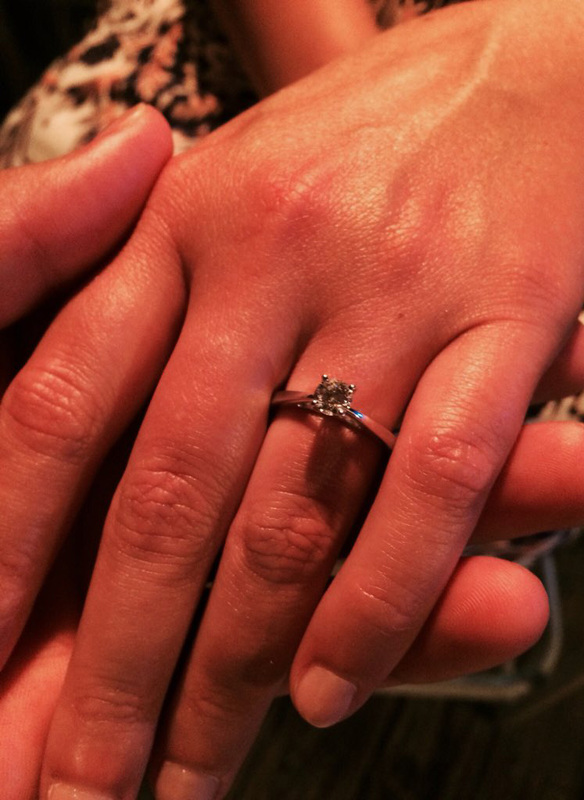 At first, she had a ring picked out online that she wanted. However, fear of purchasing something so important from the internet combined with the advice we received from a jeweler friend turned us in a different direction. This is the actual photo Sidney took inside of Zales once she put the ring on for the first time. She then sent me the photo so I knew exactly what she wanted. Sidney found a ring she liked at Zales. She went to the store by herself, tried it on, and took photos. A short time later we went to the mall and looked at it together. The ball was now in my court. 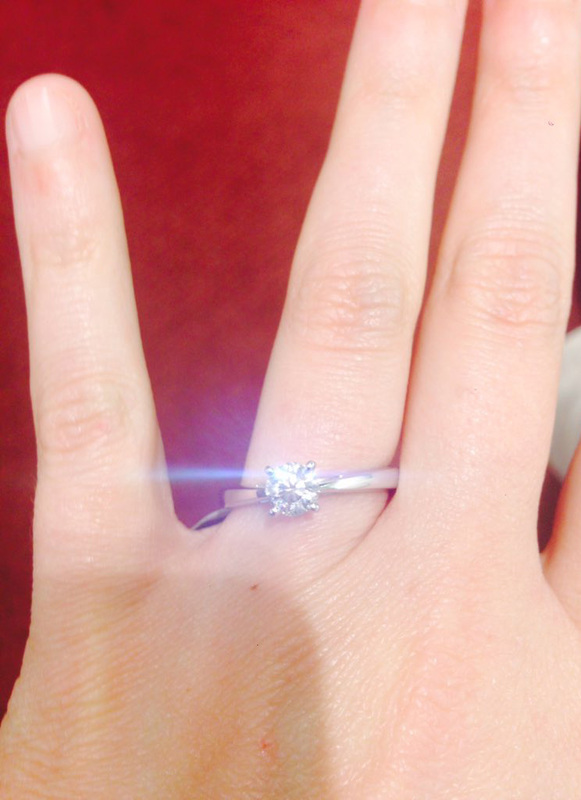 A few weeks later on that sunny May day, I confidently purchased the ring. The moment I walked out of the store I had an overwhelming fear come over me…You better not lose that little box. After taking my own photos of it when I got home, I stuffed it into a corner of my apartment closet. About six weeks later, I presented it to Sidney. 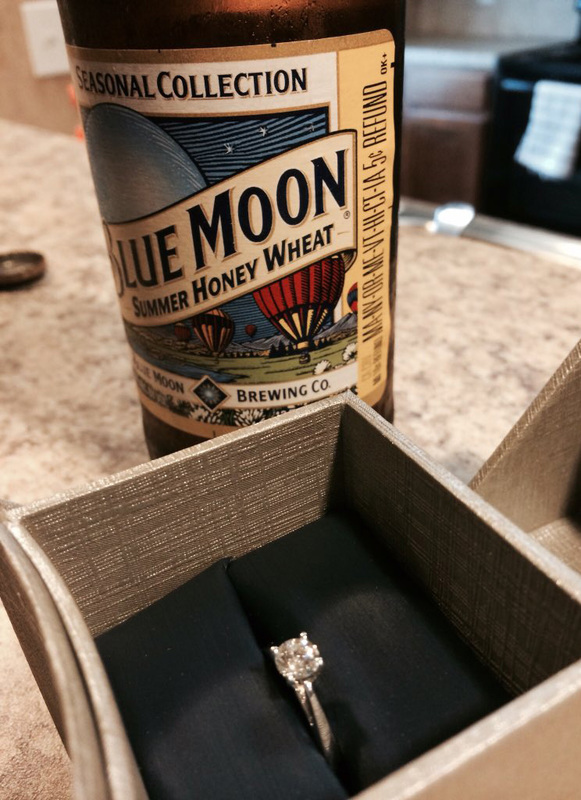 I had a celebratory beer after I bought the ring when I got back to my apartment. I thought it was a really cool idea at the time to take a photo of the ring with the bottle. Listen up guys, don’t be embarrassed to ask your girlfriend about her ring preference. It is imperative that you get it right. Sure you will show your cards a bit about your future plans but at the same time it will give your girlfriend reassurance. Be sure not to neglect that important conversation. Don’t Blink.